My office is ab out 37 miles from home. If I take the train, it takes about an hour and a half. Assuming everything all works out beautifully. Which is pretty much never the case, because this is the train net and this is England. The station is about ten minutes walk away, the train to Stratford takes about 52 minutes, then it takes about five minutes to walk to the DLR, then about fifteen to twenty minutes to reach Canary Wharf. The problem is, there are several places that a delay is introduced, the trains are often a few minutes late here and there, or they stop outside Shenfield for a while for reasons that appear to be entirely random. An hour and half is really a very good trip. Coming home it is even worse, the trains run every ten minutes or so, in theory. But during January, I was delayed more often than not and I failed to get a seat for about 30% of the trips back, at least for the first 40 minutes or so. I could use a different train. The C2C service leaves from a station that is a twenty minute walk away, but it is faster. The major downside is that it has a reputation for extreme overcrowding at night. Either way, I still need to use the DLR to get to the office. Did I mention that the train is not exactly cheap either ? A monthly travel card is £337.50, the DLR costs £3.40 a day. With 20 working days a month, this adds up fast. Travelling by train costs me about £405 a month. Heathcliff is a Triumph Tiger Sport. Over the next three years, he will cost me about £150 / month in depreciation. Insurance is another £300 / year and road tax is a frankly insane £81. Total – £302 / month. 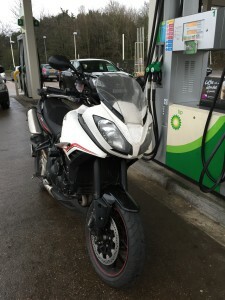 Assuming I spend less than £100 a month on servicing, tyres, MOT’s, helmets, leathers, gloves, boots and assorted other bits and pieces, then it will be cheaper than taking the train. Even if I blow the budget though, the bike is faster. In general I can get from car-park to car-park in under an hour. Sure I have to spend time locking my bike and then walking to the office from the underground parking garage, but even including that walk it is faster. The real beauty though is that I am no longer dependent on trains and the vagaries of the timetables. I no longer have to be at the mercy of the train drivers unions and I no longer have to worry about the wrong type of leaves on the train track. Obviously commuting on a bike does have a few downsides. It can get a little cold and damp at times. Having waterproof gear helps significantly, as do heated grips on my bike. The best bit though is the lack of standing on a station platform waiting for the next train. On the bike I am constantly meeting. Even if I am stuck in traffic, waiting for a BMW to give me a few more centimetres of room to avoid taking his mirrors off, I am usually moving. My journeys are faster and way more fun…. The Problem with passwords I have this idea for a video game….